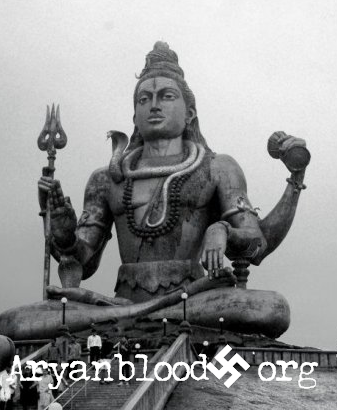 The great mantra dedicated to Shiva as Mrityunjaya is found in the Rig Veda. It is called the Maha Mrityunjaya mantra, the Great Death-Conquering mantra. It is a mantra that has many names and forms. It is called the Rudra mantra, referring to the furious aspect of Shiva; the Tryambakam mantra, alluding to Shiva's three eyes; and its is sometimes known as the Mrita-Sanjivini mantra because it is a component of the "life-restoring" practice given to the primordial sage Shukra after he had completed an exhausting period of austerity. The Maha Mrityunjaya mantra is hailed by the sages as the heart of the Veda. Along with the Gayatri mantra it holds the highest place among the many mantras used for contemplation and meditation. The Mahamrityunjaya Mantra is very special. Chanting this mantra has helped people overcome incurable diseases and avoid early death. This mantra is devoted to Lord Shiva. When pleased with devotee, Lord Shiva protects one from accidents,terminal diseases and death. One is able to get over the malefic effects of planets. It is customary to chant the mantra 125 thousand times over a period to promote long life. # OM is not spelt out in the Rig-Veda, but has to be added to the beginning of all Mantras as given in an earlier Mantra of the Rig-Veda addressed to Ganapati. This Mantra is given in the prayer page of my Book "Maharishi Jaimini's Upadesa Sutra". TRYAMBAKKAM refers to the Three eyes of Lord Shiva. 'Trya' means 'Three' and 'Ambakam' means eyes. These three eyes or sources of enlightenment are the Trimurti or three primary deities, namely Brahma, Vishnu and Shiva and the three 'AMBA' (also meaning Mother or Shakti' are Saraswati, Lakshmi and Gouri. Thus in this word, we are referring to God as Omniscient (Brahma), Omnipresent (Vishnu) and Omnipotent (Shiva). This is the wisdom of Brihaspati and is referred to as Sri Duttatreya having three heads of Brahma, Vishnu and Shiva. # SUGANDHIM refers to His fragrance (of knowledge, presence and strength i.e. three aspects) as being the best and always spreading around. Fragrance refers to the joy that we get on knowing, seeing or feeling His virtuous deeds. # PUSTIVARDHANAM: Pooshan refers to Him as the sustainer of this world and in this manner, He is the Father (Pater) of all. Pooshan is also the inner impeller of all knowledge and is thus Savitur or the Sun and also symbolizes Brahma the Omniscient Creator. In this manner He is also the Father (Genitor) of all. # URVAAROKAMEVA: 'URVA' means "VISHAL" or big and powerful or deadly. 'AAROOKAM' means 'Disease'. Thus URVAROOKA means deadly and overpowering diseases. (The CUCUMBER interpretation given in various places is also correct for the word URVAROOKAM). The diseases are also of three kinds caused by the influence (in the negative) of the three Guna's and are ignorance (Avidya etc), falsehood (Asat etc as even though Vishnu is everywhere, we fail to perceive Him and are guided by our sight and other senses) and weaknesses (Shadripu etc. a constraint of this physical body and Shiva is all powerful). # BANDANAAN means bound down. Thus read with URVAROOKAMEVA, it means 'I am bound down by deadly and overpowering diseases'. # MRITYORMOOKSHEYA means to deliver us from death (both premature death in this Physical world and from the neverending cycle of deaths due to re-birth) for the sake of Mokshya (Nirvana or final emancipation from re-birth). # MAAMRITAAT means 'please give me some Amritam (life rejuvinating nectar). Read with the previous word, it means that we are praying for some 'Amrit' to get out of the death inflicting diseases as well as the cycle of re-birth. The Sanskrit mantras were discovered by Vedic seers through intuition. The mantras have the power to transform aspirants by putting them directly in touch with the divine powers. 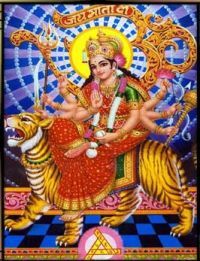 The great deities, their attributes and their mantras are the blessings handed down to us. One of the extraordinarily powerful mantras in Mahamrityunjaya Mantra, which gives health, longevity and divine blessings. Mrityunjaya is the form of Shiva who warded off death in the case of his devotees like Markandeya. The constant sravana (attentive hearing) of the mantra as rendered by traditional pandits in this album will confer on you the blessings of a long and healthy life. 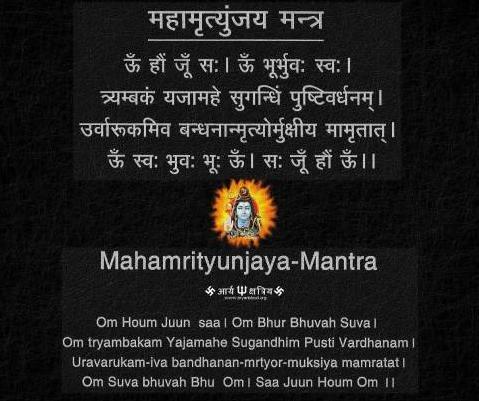 About - Mahamrityunjaya Mantra is one among the oldest and most important Mantra's in Indian mythology and spirituality. This mantra belongs to Lord Shiva. It is a combination of three Hindi language words i.e. ‘Maha’, which means great, ‘Mrityun’ means death and ‘Jaya’ means victory, which turns into conquer or victory over death.It is also known as ‘Rudra Mantra’ or ‘Trayambakam Mantra’. The Maha Mrityunjaya Mantra is said to have been created by Rishi Markandeya. The Moon was once in trouble, cursed by King Daksha. Rishi Markandeya gave the Mahamritryunjaya Mantra to Sati, Daksha's daughter, for the Moon. 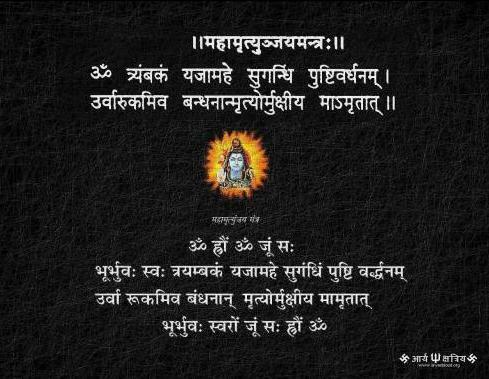 According to another version this is the Bija mantra as revealed to Rishi Kahola that was given by Lord Shiva to sage Sukracharya, who taught it to Rishi Dadichi, who gave it to King Kshuva, through whom it reached the Shiva Purana. Vedic chanting of Maha Mrityunjaya mantra by 21 brahmins. This track has been taken from powerful chanting album 'Moksha'. Shiva, ( Sanskrit: “Auspicious One”) also spelled Siwa or Siva , one of the main deities of Hinduism, whom Shaivites worship as the supreme god. Among his common epithets are Shambhu (“Benign”), Shankara (“Beneficent”), Mahesha (“Great Lord”), and Mahadeva (“Great God”). Lord Shiva showers his blessings on devotees swiftly. He is known to act in their favour without delay (one of his divine names is Aashutosha -- quickly pleased by devotions). And when he whose very name is Shiva (the auspicious -- the traditional Sanskrit thesanurus brackets the word with Bhadram, Kalyanam, Mangalam, Shubham), showers his blessings on his devotees one can imagine their good fortune.